In other words, it’s a search engine within a social network. However, it’s not really meant to function like a search engine which provides you prioritized links. Instead it’s something more akin to an information bank, a pool of untapped resources you already have which needs organization. In this way, you’ll find direct answers from within your own network. If this sounds familiar, then you may be thinking of Google’s Knowledge Graph. Considering the capabilities of that service on Google, and the shared “graph” terminology, then perhaps you’re not surprised to learn that two former high-level Google employees are the brains and brawn of Facebook’s Graph Search project. 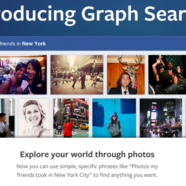 Facebook Graph Search is beginning today, with a limited Beta release. You can learn more about the project on its official Facebook launch page. How Will Facebook Graph Search Affect My Business? Maybe a potential prospect asks the question, “what accountants are recommended in Washington D.C.?” If you’re the accountant in question, and that individual has people in their network who have interacted with you and liked your page, then chances are you’ll be displayed. Now, how should you tailor your small business social media plan in order to benefit from Facebook Graph Search? The key will likely be an increased emphasis on personal interactions, and stimulating an engaged network of followers. Simply having a lot of “Likes” isn’t going to cut it, similarly to how useless, keyword-stuffed content was given the ax by Google. You want people to be tuned into your business’s Facebook page, and not simply be empty numbers that you impress yourself with. You can encourage that level of interaction by asking your followers questions, responding to their questions, posting the type of content that they’re most likely to enjoy, sharing relevant news and material that doesn’t come from your own site simply as a resource… and on down the line. It’s about real connections and interactions with real people. If you take that approach with your small business social media plan, then Facebook Graph Search should be a boon for you.